In this tutorial I am going to demonstrate how to build a JSON API using Ruby on Rails and then code a fully-functional React frontend to interact with the API. 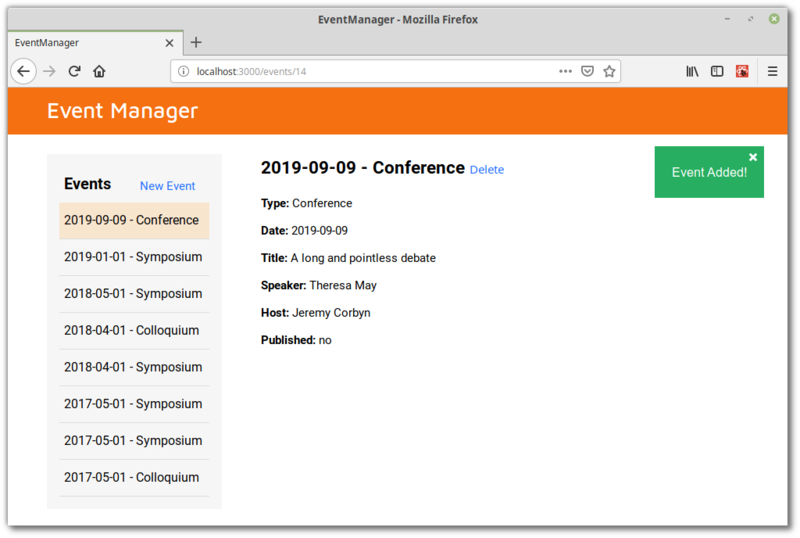 The app we’ll be building is an event manager, which will let you create and manage a list of academic events (I work for a university). This is what the finished app will look like. You can find the complete code for the tutorial on GitHub. To follow along, you’ll need both Ruby and Node installed on your system. For Ruby you can either go here and download the official binaries for your system, or use a version manager such as rbenv. The same goes for Node. You can either go here and download the official binaries for your system, or use a version manager such as nvm. In both cases I would encourage people to use a version manager. They are easy to set up and make managing multiple versions of Node/Ruby a breeze. They also help negate permissions problems, meaning you don’t end up having to install gems/packages with admin rights. For this tutorial I’ll be using Ruby version 2.6, Rails version 5.2.2. and Node version 10.15.0 (the latest LTS). My operating system is Linux Mint, so any terminal related commands will be tailored towards ‘nix. The first thing we’ll need to do is to install Rails and create a new Rails app. Depending on your OS, you might need to install the libsqlite3-dev library, as unless otherwise specified, Rails uses SQLite as its database. Finally, seed the model with some test data. You can do this by creating a db/seeds/events.json file and adding the contents from the corresponding file in the project repo. (0.3ms)  SELECT COUNT(*) FROM "events"
In the next step, we’ll create an Events controller to respond to incoming requests to our API. We’ll put the controller in its own folder, as we’re going to namespace it. This will keep our code nice and organized and allow us to create our own set of routes for the API. Next, we’re going to install the responders gem. This will provide us with a respond_with method which will keep the controller code nice and DRY. This method used to be part of Rails core, but was moved into a gem in Rails 4.2. Then run the bundle command. Next, add the following code to app/controllers/api/events_controller.rb. Notice that we’ve namespaced it under Api. Here we start off by declaring that our controller will respond to JSON requests. We then define controller methods corresponding to the CRUD actions we wish to perform, then finish off by listing which parameters may be used for mass assignment. Which, applied to the whole controller, would make for quite a bit more code. The reason this is necessary is that Rails has a built in mechanism to protect against cross site request forgery (CSRF) attacks. By default this sees Rails generate a unique token and validate its authenticity with each POST PUT PATCH DELETE request. If the token is missing, Rails will throw an exception. However, as we are building a single-page app, we will only have a fresh token upon first render, which means we will need to alter this behaviour. The above code ensures that if no CSRF token is provided, Rails will respond with an empty session, which is fine for our purposes. Finally let’s fix up the routes in config/routes.rb. The routing for the controller has to consider the fact that it’s within the Api namespace. We’ll do this using the namespace method. 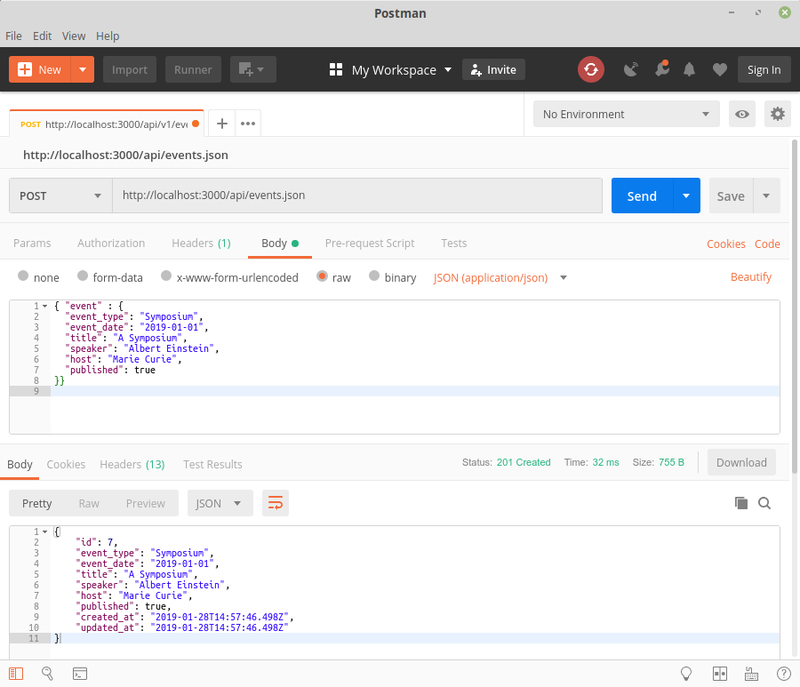 You might also like to test the API with Postman. Here’s how you would create a new event. Add it to your Gemfile, then run the bundle command. Next, we’re going to need to install Yarn, as this is Webpacker’s package manager of choice. to get the latest version of the @rails/webpacker package. Let’s add a site controller with a blank index action, and make that the root of our new project. Now (re)start the Rails server, hit http://localhost:3000/ and you should see “Hello World from Webpacker” logged to the console. At this point it might be advisable to have a poke around the application to see which extra files Webpacker has created and/or modified. It’s also worth having a peek in package.json to see what has been installed there. Now we can get on to building the React app. Let’s start off in App.js where we will require and render our <Editor> component. Here we are declaring an events property in state. Then we are using the componentDidMount lifecycle hook to fetch the events from the API. In the render method we have a guard to make sure nothing is rendered if the events haven’t been fetched. Once they have been fetched however, we are rendering our <EventList> components, passing it a list of events as props. Nothing exciting going on here. We’re just rendering a header element. Here we have a renderEvents method which returns a sorted list of events for the render method to display. Note that we have also implemented some simple prop validation to ensure that the component is passed an array. If you visit http://localhost:3000 you should see a list of events displayed. Exciting, huh? Add the final three packages to the devDependencies section of package.json and run yarn. This will tell ESlint to use the Airbnb ruleset we just installed. It will also allow files with a js ending to contain JSX and switch off warnings for console and alert statements. But for the best results, you’ll probably want to integrate it into your editor. I’m using Sublime Text 3 with SublimeLinter, SublimeLinter-eslint and ESLint-Formatter to great effect. Also, while we are looking at tooling, you might like to take a minute to check out React’s Developer Tools. These let you inspect the React component hierarchy, including component props and state and are available as a browser extension (for Chrome and Firefox), and as a standalone app. 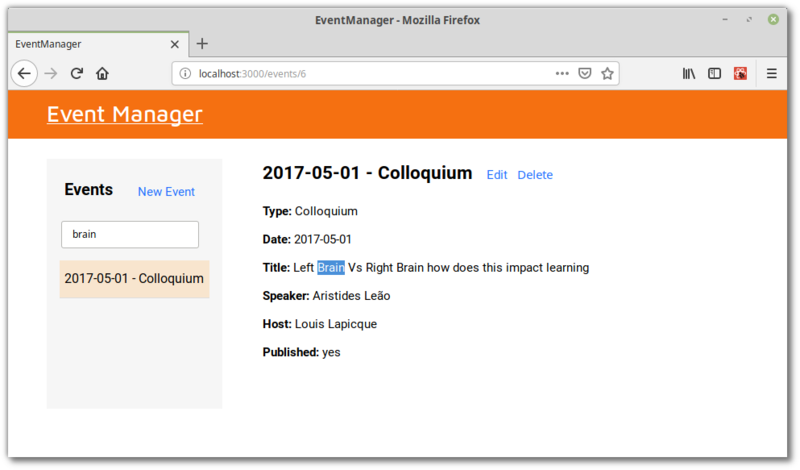 Next, let’s make the events list clickable, so that when a user selects an event, its details are displayed on the screen. 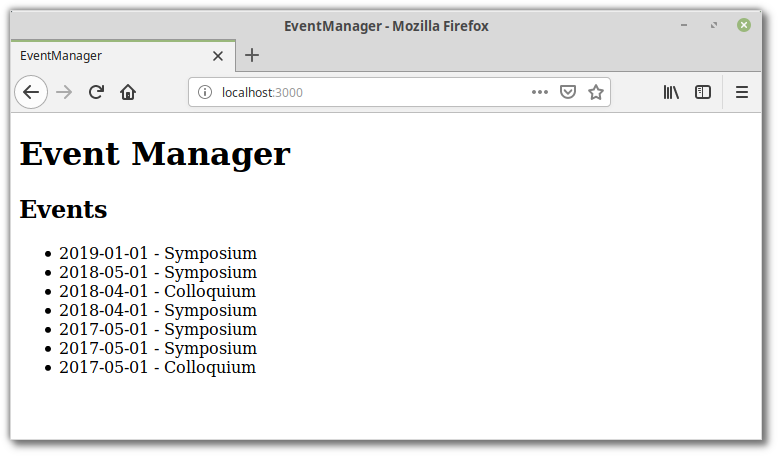 For this we’re going to need React router, which will change the URL to reflect the current event and provide us with an outlet for our event information. In the first line we’re pointing our root route to http://localhost:3000/events, this is purely for aesthetic reasons. However in the four lines that follow, you can see that we are informing Rails about the routes we will be using in our React application. This is important, as otherwise if a user requested any of these routes directly (by refreshing the page, for example), Rails would know nothing about them and would respond with a 404. Doing things this way means that Rails can simply serve our React app and let it work out which view to display. This wraps the app in a <BrowserRouter> component, that uses the HTML5 history API to keep the UI in sync with the URL. Instead of rendering our <Editor> component directly, we will now use a <Route> component to render it whenever the browser’s URL matches the route’s path. As we have made the :id part of the route optional (due to the question mark) and we are pointing our root route at /events, this will always be the case. By doing things this way, we will have access to the URL params within the <Editor> component, that will come in handy later on for determining which event we are dealing with. 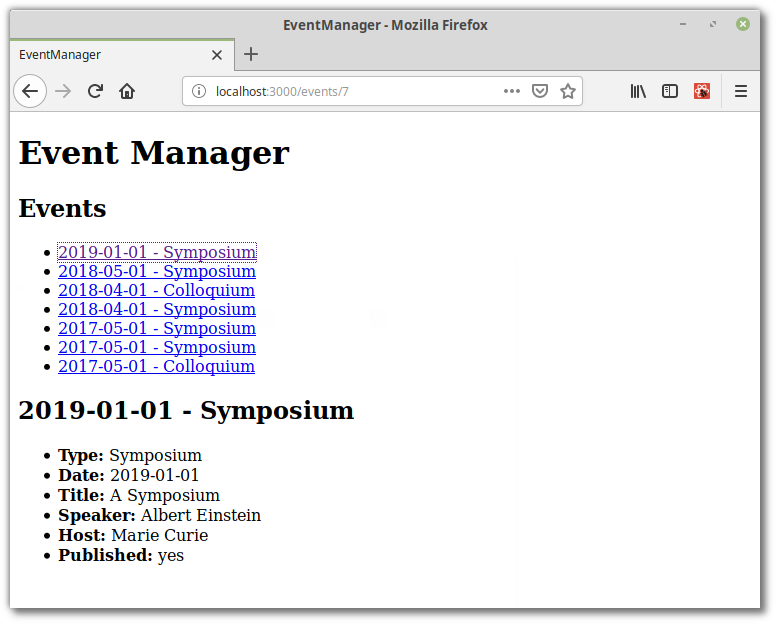 Next, we’ll need an <Event> component to display the event. There’s nothing too wild going on here — this component is expecting to be passed an event object as props and will display it accordingly. Next, let’s make the list of events in <EventList> clickable. When clicked, they should navigate to /events/:id. Here, we are making use of React router’s <Link> component to create the navigation around our application. If you look at the render method, you’ll notice we’re using a new component called <PropsRoute>. This is because when a user selects an event, we want to pass that event to the <Event> component, so that it can display it. Unfortunately, out of the box, React Router doesn’t offer an easy way to pass props to a route, so we’re left to write this ourselves. And now when you click on a link, the correct event should display. Now that we have React router up and running, we need to disable Turbolinks, as it messes with the back button’s functionality. Please note that these are all of the styles we will need in the app. Listing them all in one go is intended to keep the article a tad shorter. Now everything should be styled nicely. Now it would be nice to add some kind of indication that a user has selected an event. This isn’t too tricky. 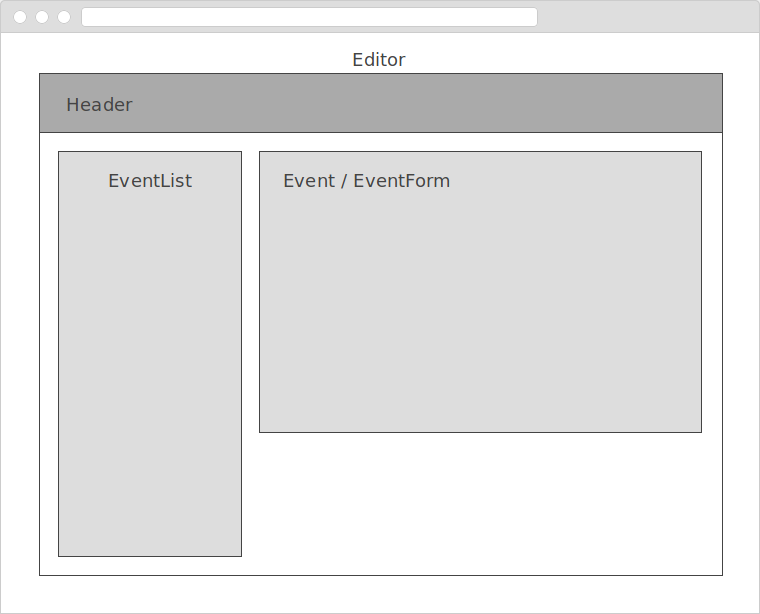 In the <Editor> component pass in an activeID prop to the <EventList> component. In the <EventList> component, use this to apply a class of active when rendering the list. 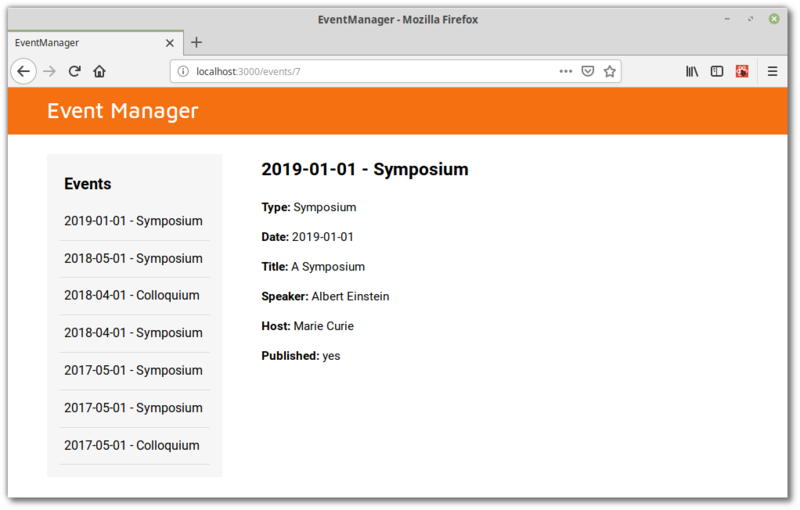 We already added some CSS styles for the active link, so when you now click on an event, the details should be displayed and the event should be highlighted accordingly. So far we have the Read functionality of our CRUD app. Now let’s add the ability to create an event. Here, we’ve introduced a <Switch> component, which will render the first child <Route> that matches the location. 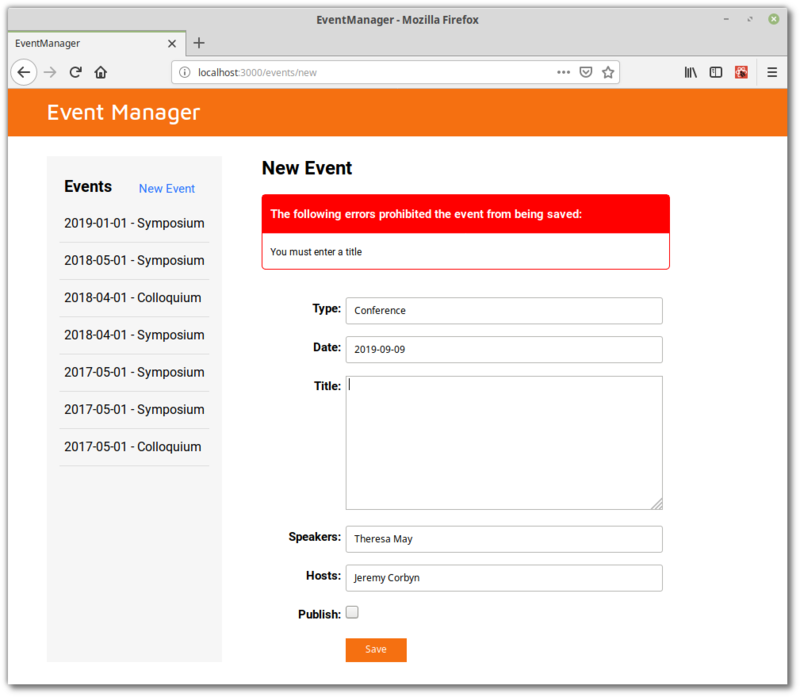 This is practical, as we don’t want the new event form and the <Event> component to display at once. At this point the form should appear and when you click Save, it should log “Submitted” to the console. Now, let’s add in some validation to make sure all of the fields (apart from published) are filled out. All of the action will take place in the <EventForm> component. We start off by defining two properties on state: event and errors. The event property is taken from props (you’ll see why in a bit) and for now it is assigned some sensible defaults at the bottom of the file. The errors property is initialized as an empty object. Within the render method, we add an onChange property to all our form inputs, which we bind to a new handleInputChange method. This method will update the event object we are holding in state, so that at any given time, this.state.event should mirror what has been entered into the form. We can then expand our handleSubmit method to check for errors when the form is submitted. In our case, this will simply be that each field has a value. If any errors are detected, the error object that we are holding in state is updated and the errors are output to the page. Expected 'this' to be used by class method 'validateEvent'. Expected 'this' to be used by class method 'isEmptyObject'. 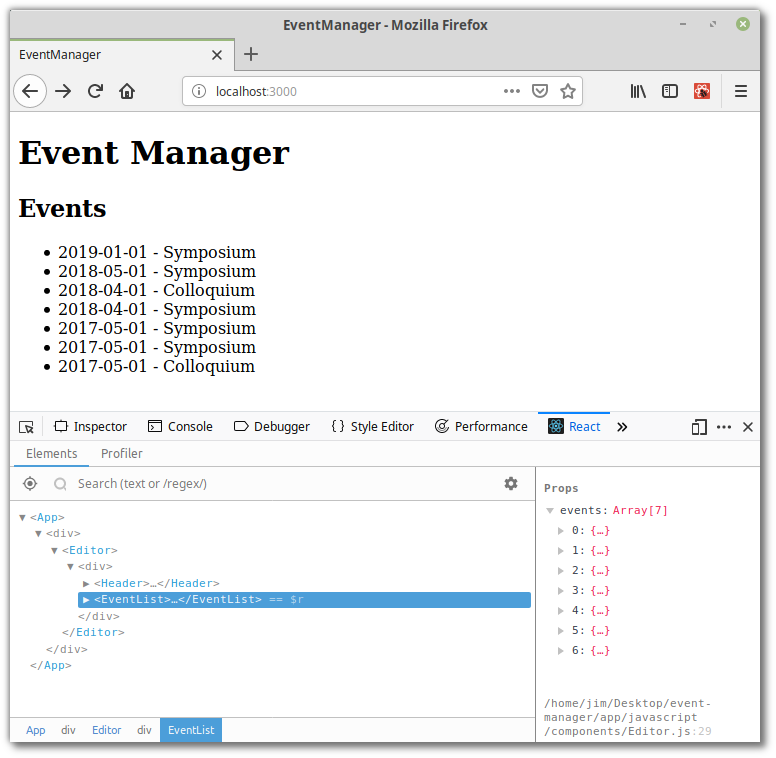 And adjust in the <EventForm> component. Now when you attempt to submit a form which is not properly filled out, you should see some nicely formatted errors. The next thing to do is to wire up our date field as a datepicker. For this we’ll use Pikaday. As you notice, we are creating a ref on the input so we can reference it elsewhere in the code. Thanks to our ref, the field property of the configuration object that we are passing to Pikaday’s constructor, points to DOM element we want to turn into a datepicker. The onSelect method determines what will happen when the user selects a date. In this case, the date is formatted into a YYYY-MM-DD string and the event object we are holding in state is updated. And that’s it. We now have a datepicker. At the time of writing, the current version of Pikaday is 1.8.0 and this version will cause two warnings to be shown in the webpack console. The first is caused by the way Pikaday includes the Moment library, which it has now made an optional dependency. You can read more about this here and here. The second is caused by Pikaday having made Moment an optional dependency. You can read more about this here. However, these issues are on the roadmap to be fixed in Pikaday version 2.0 and messing around with code in the node_modules folder isn’t the best idea, so for now I’m going to ignore them. To actually save an event to the database, we’re going to pass a callback function to our <EventForm> component, that can be called in the context of its parent. As you can see, we have defined an addEvent method, which receives a newEvent object and then fires off a request to our API to create a new event using that data. If the request is successful, it will add the newly created event to the array of events that are being held in state and the UI will update accordingly. It will also use the history object, which is made available to us by React Router, to change the URL to that of the newly created event. Now, when you attempt to save an event to the database, you should get an alert pop up, informing you that the save was successful. If you’re following along, I’d encourage you to give this a try and satisfy yourself that everything is working before continuing. Now, if you’re anything like me, you will have created a bunch of silly events while following along with this tutorial. Let’s add a delete button so that we can nuke them. As with adding an event, we’ll want to declare a method to delete an event in our <Editor> component and pass it to our <Event> component as a prop. In out deleteEvent method, we ask the user for confirmation that they really want to delete the event via a confirm dialogue. If the user is sure, we send a DELETE request to our API and once a successful response comes back, we inform the user that the event has been deleted, redirect the user to /events and remove the deleted event from state. As with the addEvent method, if the response from the API is anything other than success, we log the error to the console. And now we can delete events. Alerts are all well and good to tell the user that something happened, but they don’t look very pretty. Let’s add flash message functionality instead, using the react-s-alert library. We’ll stick this functionality in its own helper file, notifications.js. Now we have a centralized place to set some sensible defaults and can reduce the boilerplate when calling the flash messages. You’ll also notice that I’m including the scale effect to animate the display of the messages. Note that there are a whole bunch of other effects which can be tried out by uncommenting the appropriate line and altering the default options accordingly. Now, when you create or delete an event, you should get a nicely styled flash message. The final piece of our CRUD functionality to add is the ability to update an event. Remember when we declared an event as props in our <EventForm> component? Well, this enables us to re-use the same form to update an event — if we pass an event into the component as props, the event details should pre-populate the form, otherwise the component falls back to its sensible defaults, which are exactly what we need to create a new event. Note that the route order is important, as otherwise path="/events/:id" will match first and the form won’t be displayed. Finally, in the <EventForm> component, we need to pull the event out of state and set the values in the form accordingly. And finally, we need to hook into the componentWillReceiveProps lifecycle method to ensure that the fields are cleared when a user is editing an event, then clicks New Event. And that’s that. We now have all of our CRUD functionality. Next, let’s add a Cancel button to the form (in case the user changes their mind whilst editing or creating an event). We’ll also change the title of the form to reflect which action they are performing. And while we’re at it, we’ll improve the validation for our date field — at the moment it just checks if the user has entered a value. It’d be nice to add search functionality to the events list. Luckily this is not complicated as we are holding all the events in state. Notice that we have added a ref to the input element, so that we can reference it within our component. Now let’s create that ref and declare a searchTerm property in state. We’re also creating a updateSearchTerm method which will be called every time a key press is registered on the search field. Here, we are excluding some database fields that were returned by the original Ajax call, but which we are not interested in filtering by. Et voilà! We have search. The last thing we will do is add a component to render when an event is not found. This might be useful if a user has bookmarked an event which has since been deleted. Now if the user attempts to view or edit a non-existent event, they will be shown a 404 component. And that’s everything. Well done if you’ve made it up to here. You should now have a fully functioning React/Rails CRUD app. I hope this tutorial has helped somebody, I’d be glad to hear your comments in the discussion below.